​For visitors to Vermont, the President Calvin Coolidge State Historic Site in Plymouth Notch has long been a “must see” destination. 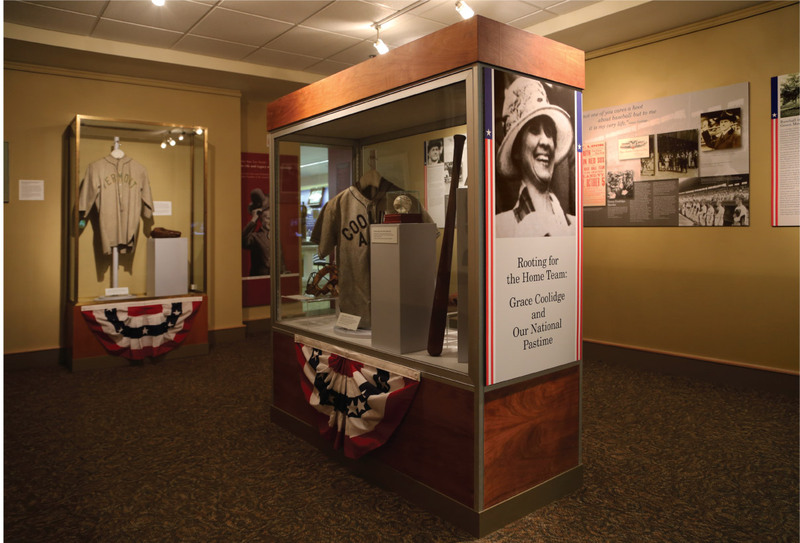 In parallel with the opening of the Site’s 2013 season, CGD has just completed the design and installation of “Rooting for the Home Team: Grace Coolidge and Our National Pastime”, an exhibit that tells the story of First Lady Grace Coolidge’s passion for baseball. Installed in a space adjacent to the Historic Site’s main exhibition on President Calvin Coolidge, “Rooting for the Home Team…” features a primary wall display of text and archival images in three parts: “Presidents and Baseball”, “First Lady of Baseball”, and “Baseball in the Green Mountain State”. To present a selection of artifacts and memorabilia including uniforms, signed baseballs, and Grace’s numerous American League season passes, CGD created multi-level “still life” arrangements within three existing display cases. Four additional wall pieces, including a pastel portrait and the “First Lady of Baseball” recognition certificate, complete the exhibit. To evoke the spirit of Opening Day, the design team attached authentic, miniature “bunting” to the main display cases. The exhibit will be in place through December 2013.